In a matter of seconds, a squirrel’s life was ended, locked within Dusty’s jaws. This incident sparked a flurry of emotions. Some students who witnessed the attack expressed shock and outrage. Burke said one woman yelled at her for not calling Dusty back before he reached the squirrel. Later in the day, a residential assistant confronted Burke about the situation and wrote her up to Public Safety, which Burke said was “out of her jurisdiction.” However, while the RA oversees a different residence hall than the one in which Burke lives, all residential assistants have the authority to report any incidents they deem problematic. Rumors ran amok on campus. Since Dusty is hard to miss, people quickly pointed him out as ‘that Husky who killed the squirrel’ with some fearing that Dusty might eventually hurt or kill students the same way. There were allegations that Dusty was off leash, which could make Burke liable for a $25 non-compliance fine, according to the Mills Animal Policy. Some students have argued that Dusty is not a legitimate service animal, not only because of this incident, but also due to the fact that he does not look like the average service dog and was not wearing the identifying vest that specifically indicates his role. Criticism was also aimed at the way Burke handled the situation after the attack, when she disposed of the squirrel carcass in a trash can. 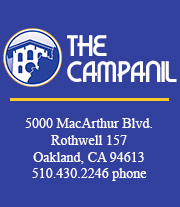 Due to the strong reaction of the Mills community and the many questions that still surround Mills’ service animal policy, The Campanil decided to take a closer look at the incident and how service animals are handled on campus. Dusty is not your average service dog, like the more popular assistance breed, the Labrador Retriever. He is a Native American Indian Dog and Husky breed with a dark gray and white coat, weighing just over 100 pounds. Burke, who lives on campus, said people frequently tell her Dusty “is the biggest dog [they have] ever seen,” and are surprised to find out that he is only 2 years old and still expected to grow. Burke’s boyfriend had Dusty before Burke began to use him as a service animal. Dusty was “supposed to be a pet” until everything changed around five months ago. Dusty alerts Burke immediately when her blood sugar is too low or too high by making noise, whines and whimpers — sometimes during class, much to Burke’s chagrin. During the summer, Burke began training Dusty on her own to hone his innate talents as a diabetes dog and work on his behavior in public. She brings him to Mills 2-3 times a week to sit with her in class, but believes that Dusty is not ready to live with her full-time yet. Dusty is technically considered a service-animal-in-training which could explain his behavior, which is decidedly more energetic than the average service animal. Though Burke maintains that Dusty is a very quiet and well-behaved dog, he still has moments of excitement because he’s “still a puppy.” During an interview with The Campanil, Burke looped Dusty’s leash around her ankle when Dusty got excited at the company of another dog in the newsroom. Gabriella Tempestoso, the assistant dean for Services for Students with Disabilities (SSD), said service-animals-in-training like Dusty are “protected the same way as service animals under the ADA” — the Americans with Disabilities Act of 1990. Service animals can be trained by “a non-certified professional” like Burke, according to Disability Rights California. Due to Dusty’s appearance, his credentials as a service animal are often called into question. At present, Dusty does not wear the brightly colored vest or patch that service animals typically wear, which have the title of “Service Dog” on them. However, Burke is in the process of purchasing a vest with a “Please Ask to Pet Me” patch, to alleviate suspicions that Dusty is not a service animal. “Legally, to be a service dog, you don’t need a vest or any form of identification. But people question it a lot [when Dusty] doesn’t have that,” Burke said. Contrary to the rumors, Dusty is officially registered and recognized by the College as a service animal. As confirmed by Linda Zitzner, the Associate Vice President for Operations, the incident report states that Dusty broke away from his leash. Niviece Robinson, director of Public Safety, said her department had “turned that over to the SSD coordinator,” Tempestoso, to handle the situation. “Occasionally, something is going to happen,” Tempestoso said. Despite the policies that are supposed to prevent incidents like Burke’s, Tempestoso understands that service animals are still animals first and foremost. Burke said Dusty acted out that day because she had to bring him to Mills earlier than expected, which eliminated his morning routine of barking at squirrels in the backyard. The moment Dusty saw the squirrels in front of NSB and tore himself free from her, Burke knew that trying to call Dusty back would be futile because he would not respond until he had claimed his prize. After the incident, Burke said she contacted Campus Facilities to let them know which trash can she had deposited the squirrel body in because she had to get to class. The incident was a very emotional experience for her because of the initial negative response, but more and more people have recently approached her to express their support. Unless you are a squirrel, Burke said Mills students have nothing to fear about Dusty. Tempestoso said that there are 12 registered service animals at Mills College so far with a few more students currently in the process of registration. Even service animals that do not live on campus are encouraged to register with SSD. In accordance with the ADA, SSD distinguishes between a service animal and an emotional support animal. “A service animal is trained specifically to perform a function [such as] a seeing eye dog or a dog who is trained to… alert someone if they’re about to have a seizure,” Tempestoso said. Emotional support animals, on the other hand, “provide relief from anxiety and relief from depression” but are not trained to perform specific tasks to assist their owners. After registering with SSD, students are required to go to Public Safety to pick up a Mills Canine Permit, which has a picture of their service or emotional support animal and is renewed every year. 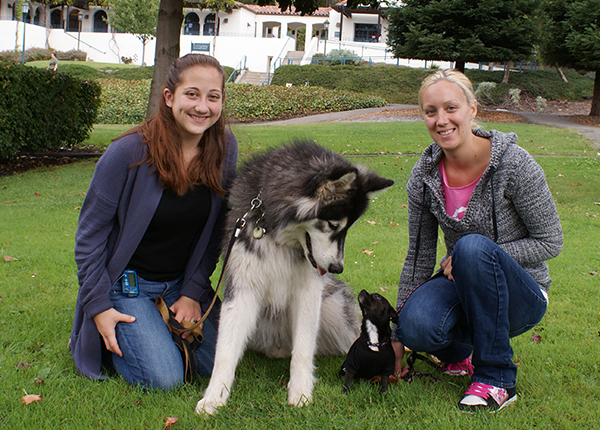 Both types of animals are also allowed to live with their owners on the Mills campus under the ADA and California law under the Fair Employment and Housing Act (FEHA) with reasonable accommodations. Professors are not typically informed beforehand if there will be a service animal attending their class, and it depends entirely on whether or not the SSD student wants to address it, though Tempestoso said the faculty tends to check in with SSD anyway. Although registered animals are allowed in all buildings on campus, Kate Carmack, an SSD student and editor at large for The Campanil, said she felt uncomfortable bringing her dog into the library. One day as Carmack was going to return books, her emotional support animal, Roxy, made a yelp getting through the door. As Carmack was walking towards the Reference Desk with Roxy, a staff member called out to her across the room, “Is that a service animal? Only service animals are allowed” in what Carmack said was a rude tone. Carmack felt the staff member did not believe her even though she carried a Mills Canine Permit because Roxy is a tiny Chihuahua. Ironically, Carmack pointed out that the staff member not only put her on the spot but was even more disruptive than Roxy had been. Associate Library Director and Special Collections Librarian Janice Braun said the library does not typically ask SSD students to show their permits or prove that their dog is a service animal. Braun assured The Campanil that students “frequently have service animals in the library,” and she encourages students to come talk to her if they have misgivings about how they will be treated. Adding to that, Zitzner said that the College is “trying to enhance policies on identifying service animals” because she has had a few students complain that people were approaching their service animals and petting them without asking. “When [the service animal is] working, that person does not want it to be treated as a pet,” Zitzner said. Burke does not mind people petting Dusty because he is a diabetes dog who doesn’t have to work as much as other service animals — up to a point. However, it does not mean people should never pet service animals. “If they’re off-duty, if they’re walking the dog and it’s in the evening and it’s sort of a leisurely time, then perhaps it’s okay,” Tempestoso said. Tempestoso also encourages students who are still deeply affected by the Sept. 10 incident to seek Counseling and Psychological Services (CPS) at Mills by signing up for an appointment at Cowell. Braun said that she hopes to bring a therapy dog into the library this semester during finals to help students relieve stress. The staff would coordinate this with the assistance of the American Society for the Prevention of Cruelty to Animals (ASPCA). Braun added this is still in the planning stages.